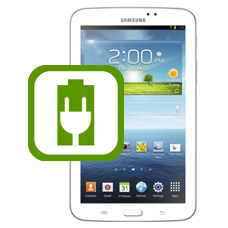 Is your Samsung Galaxy Tab 3 7.0 (SM-T210, SM-T211) is unable to connect with your computer or is not charging? Maybe you can see that the pins on the Galaxy Tab 3 7.0 dock connector are broken. If any of the above symptoms are evident then you need a new dock connector / charging port socket. Our expert Samsung tablet technicians will replace the dock connector with a brand new part. This is an in-house Samsung Galaxy Tab 3 7.0 charging port repair service, when ordering this dock connector repair service you are required to ship the tablet into our repair centre for works to be undertaken. I think the charger point that is not working ? It's not been charging for a while property and now wont even turn on.The charging point looks different from my other daughter tab. Also how long well it take to be returned to me? Based upon your description it indeed sounds like your charging point has become damaged, just order this repair and we will repair your Samsung Tab charging problems. Our turn round on Samsung repairs is 2 - 4 working days. You will have to pay for sending the device into us for repairs, however all our repair services include fully insured return shipping once your device has been repaired.